One of the strangest aspects of the 2016 presidential campaign has been the mainstream media's decision to spend equal time criticizing Trump and Clinton. This has created a false equivalence. Imagine a political contest between Godzilla (Trump) and Bambi (Clinton). Because of the equal time rule, the nightly news would report, "Godzilla destroys Los Angeles," and then, "Bambi ravishes community garden." Science reporter Art Phillips noted a similar false equivalence with regard to climate change. The mainstream media reports on some devastating climate change event -- such as record high temperatures -- and then feels obligated to feature a climate-change denier. This sets up a false equivalence, as if views on the reality of climate change are equally split; the reality is that 97 percent of climate scientists believe that the earth has been warming over the past 100 years. The media's obsession with false equivalence has influenced coverage of the 2016 presidential campaign. Donald Trump is the most despicable US presidential candidate in modern times. Hillary Clinton is a mainstream candidate. Nonetheless, the media treats them as if they are equivalent. They're not. 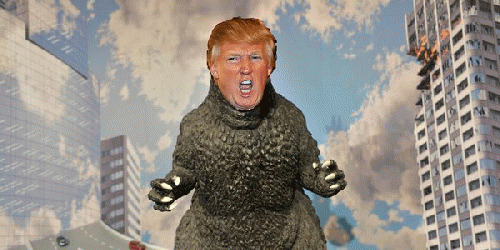 Trump is Godzilla. The biggest Trump story has been his embrace of white-nationalist policies. It started at the beginning of his campaign, in June of 2015, with his extreme stance on immigration -- calling Mexican immigrants criminals and rapists-- and has continued since. As Hillary Clinton noted in her August 25th Reno Speech: "Donald Trump has built his campaign on prejudice and paranoia." Trump's mainstreaming of white nationalism is, by far, the biggest story in the 2016 presidential campaign. Nonetheless, following their self-imposed doctrine of "equivalence," the media has typically followed tales of Trump's racism with various spins on Clinton's emails. To be clear, Hillary Clinton was wrong to use a private email server. It violated State Department policy. Nonetheless, the FBI and the Department of Justice have determined that Clinton's use of a private email server was not a crime. Therefore, the email story is not equivalent to Trump's white nationalism. What the mainstream media does not discuss is the fact that Donald Trump is unqualified to talk about Clinton's emails. He is non-technical; he does not use email or a personal computer. Moreover, Trump is not a lawyer and he has never had a security clearance.